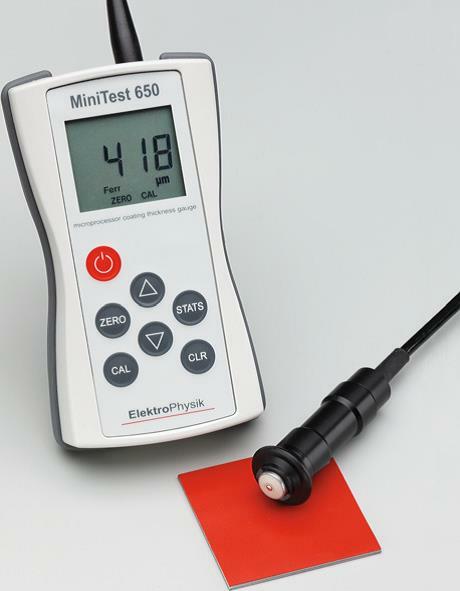 The MiniTest 650 is a rugged coating thickness gauge with fixed external probe for all non-magnetic coatings on steel and all insulating coatings on non-ferrous metals, and is successor to the MiniTest 600 tried and tested over many years. For measurement on rough steel surfaces, for e.g. in shipyards, it comes with a special wear-resistant F probe and thus enables long-term usage. It is particularly suited to measure coating thickness in rough environments and on abrasive surfaces, e.g. sandblasted steel, heavy duty corrosion protection in ship building, at offshore installations and mining facilities, on plasma-sprayed surfaces.